If you notice a large number of skunks around your residential or commercial property, contact Legacy Rodent Control for expert skunk removal in Dallas and Fort Worth. We are fully licensed and insured to humanely and safely remove skunks from your home or business and prevent them from returning in the future. Skunks are widely known for their smelly defense system, which poses a stinky situation when they feel threatened or are trapped. We know you do not want to be sprayed by a skunk, so if you suspect that you have a skunk infestation, call Legacy Rodent Control to handle it. While there are some repellents available that are designed to keep skunks away from your property, their results are temporary. The best way to keep skunks away from your home is to remove their food source. Keep trash bags and bins secured, and do not feed your pets outside or store pet food outside. Skunks also love to forage in gardens and on fruit fallen from your trees. Be sure to pick up fallen fruit and protect your garden with chicken wire to help keep skunks from wanting to stick around. We suggest you cover or secure your compost bins or piles, as well. 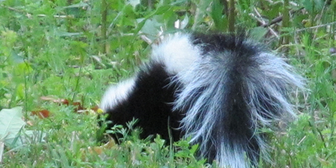 Skunks are common guests in any manicured garden. Beautiful fruits and vegetables are alluring bait. The best and most effective way to keep them out and ensure they never come back, is by placing chicken wire covering the entire perimeter of your garden plot. Because skunks are nervous animals, skunk removal in Dallas and Fort Worth must only be done by professionals trained to use humane traps that keep the animal at ease. A call to Legacy Rodent Control for DFW skunk control services guarantees expert handling of skunks that includes trapping, removal, exclusion, and damage restoration. Once the animal is trapped, we will safely relocate the animal away from your Dallas or Fort Worth property. • Skunks thrive in the suburban environment, where there is ready access to food. • Skunks spray up to 10 feet. • Skunks are nocturnal and hibernate in the winter. • Signs of skunk infestation include their telltale smell, as well as holes dug around your foundation. Skunks also will tear open trash bags and dig through trashcans, similar to raccoons. Call us today for skunk control services in and around Dallas and Fort Worth, Texas! No one wants skunks near their home- for obvious reasons. But there are other less known reasons that should make you wary, too. 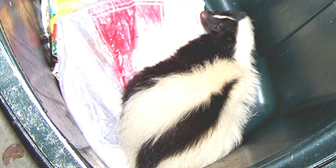 Skunks often carry ticks, fleas, and diseases, like rabies. In fact, skunks are second to raccoons in the number of reported rabies cases in the United States per year. Skunks are also destructive, and similarly to raccoons and other rodents, search out food sources in or around your home. Dealing with skunks is messy, smelly, and dangerous. Trained professionals like Legacy Rodent Control are skilled in skunk removal in the DFW area. Our team will eradicate the smell and remove skunks from your home and prevent them from returning—for good. The best way to keep and prevent skunk infestation is to identify any potential points of entry. Creating physical barriers with concrete or wire mesh will prevent the skunk from entering your property, and such barriers guarantee that you will keep your property and family safe. Skunks also love hiding, and they seek things that will provide them cover. These things include brush, firewood piles, and some types of vegetation.